Western Digital announced in a press conference this afternoon that they have reached a settlement agreement with Toshiba over Western Digital's objections to the sale of Toshiba's stake in their NAND flash memory joint ventures to a consortium led by Bain Capital. Toshiba's financial troubles came to a head a year ago with the acknowledgement of severe losses from Toshiba's nuclear power subsidiary. To maintain solvency, Toshiba was forced to offer up a share of its NAND flash memory business, by far the most lucrative portion of Toshiba's conglomerate. Over the course of several months as the severity of Toshiba's financial situation became clearer, their plans shifted to a complete sale of the memory business, valued around $18 billion. Western Digital acquired SanDisk in May 2016 and with it, SanDisk's half of the Toshiba-SanDisk partnerships to develop and manufacture NAND flash memory. Citing rights stemming from these partnerships, Western Digital claimed that Toshiba needed their consent before Toshiba could spin off and sell their side of the partnerships. Western Digital had been unable to keep pace in the bidding war for the spun-off Toshiba Memory Corporation (TMC) and sought to use whatever leverage they had to strengthen their position as one of the few major NAND manufacturers. Western Digital initiated arbitration proceedings against Toshiba in May 2017. Toshiba responded with a lawsuit in Japanese courts alleging unfair competition and mishandling of Toshiba trade secrets by Western Digital. As the disputes escalated, they also became more acrimonious, with Western Digital accusing Toshiba of cutting off some Western Digital employees from accessing shared databases and facilities. Toshiba also shut Western Digital out of the initial round of investment into a new fab. While Toshiba and Western Digital did manage to re-open negotiations, Toshiba eventually decided to sell TMC to a consortium led by Bain Capital and including US companies like Apple, Seagate and Dell as investors, as well as competing NAND manufacturer SK Hynix. That deal was signed in September and approved by the Toshiba board and shareholders a month later. With today's settlement and cessation of all hostilities, it appears at first glance to be a loss for Western Digital, who is not going to be acquiring a larger share of the joint ventures. However, several of the agreements have been extended through 2027 and 2029 (one had already been extended to 2029), and the terms have been updated to strengthen the protections for the joint venture intellectual property: While Western Digital competitors like SK Hynix and Seagate are investors in the purchase of TMC, they will not gain access to any of the IP. Western Digital has also secured the right to match Toshiba's future investments in the new Fab 6 at Toshiba's Yokkaichi operations and in a new wafer fabrication project in Iwate. This is crucial to Western Digital's long-term competitiveness because they would not be able to begin manufacturing NAND flash outside of the joint ventures without essentially starting from scratch. Western Digital also provided an update on their outlook for the current second quarter of fiscal year 2018, and for 2018 overall. 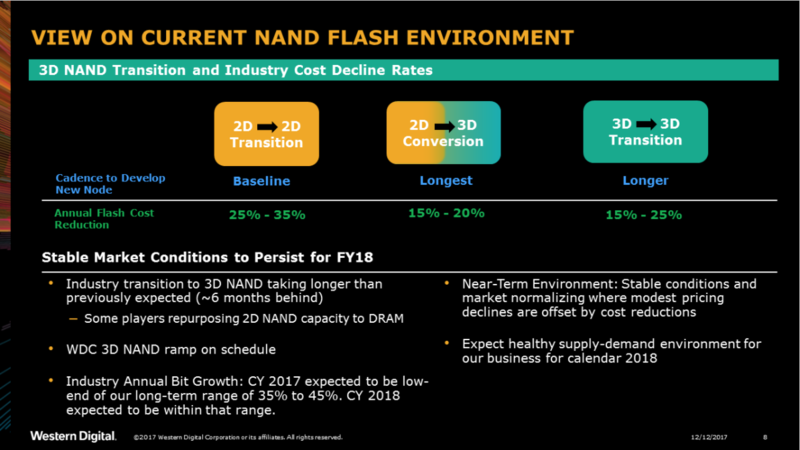 They expect to finish calendar year 2017 with over 65% of their NAND flash bit output having transitioned to 3D NAND, and over 90% of their 3D NAND output is on their current 64L BiCS3 process. Their 96L BiCS4 process will debut in a retail product due to ship this week (! ), but no further details on that are available at this time. Longer term, Western Digital expects to continue reducing NAND costs at a faster pace than the 2D to 3D transition has allowed for, but evolving 3D NAND is expected to be slower than the progression of process shrinks was for 2D NAND. Modest price declines for NAND are expected as the industry-wide shortage relaxes, though one factor delaying this is the fact that some competitors have chosen to migrate some 2D NAND fabs to DRAM manufacturing instead of 3D NAND, in order to address the shortage of DRAM that also exists. Can we joke that once OCZ announced that Toshiba had agreed to purchase nearly all of OCZ's assets it was down hill for them both. I have SSD's from both OCZ and Toshiba and Intel and Samsung. Once I started buying SSD'd I never went back to a Western Digital black or any other platter drive. Story WD was late to the Flash game. HDs will be here for a very long time, NAND is just too expensive. We already have 14TB now, and going to 20+TB, to get 14TB of NAND would cost a fortune. As it happens, I am using 16TB flash SATA disk for two years already. As for the cost of it, "if you had to ask...", but same goes for large mechanical drives - I know incidental cases of someone buying disks exceeding 4TB, and none for personal use. It's true in this case, I did not paid for the disk from my own wallet. For personal storage, I have been torn between buying pair of 10-12TB drives, and building a NAS. The latter won - and for less than 2x10TB, I've got raid-6 of 2TB drives, with a server attached including BBU and UPS, running on ECC memory and quad ethernet adapter. However... there is widening performance gap between NAND, or in general NVM storage, and mechanical storage. While growing platter density is keeping their usefulness, there is non-zero possibility of them fading into same hole, tape storage disappeared in from general public view. "We already have 14TB now"